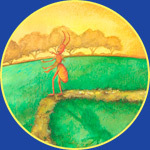 We hope you enjoyed the story of How Ant Changed the World and our web exhibit, Anatomy of a Children's Book. We'd love to hear from you. If your choices for your children include our lovable children's books, join our journey, and together, we can spin the publishing world around to achieve our Ahhh, Finally moment. Sign up now for our email update list. AhhhFinallyBooks@aol.com Click here to send an email about this site to a friend.